With an abundant and diverse collection of over 80 recipes, The Best of Thanksgiving is the solution to creating a delicious and welcoming meal with ease. With vegetarian, gluten-free and adults-only and kid-friendly dishes there’s something for everyone in this tome to holiday. Special additional sections include: leftovers, menus, wine pairings, turkey know-how, and basic recipes. 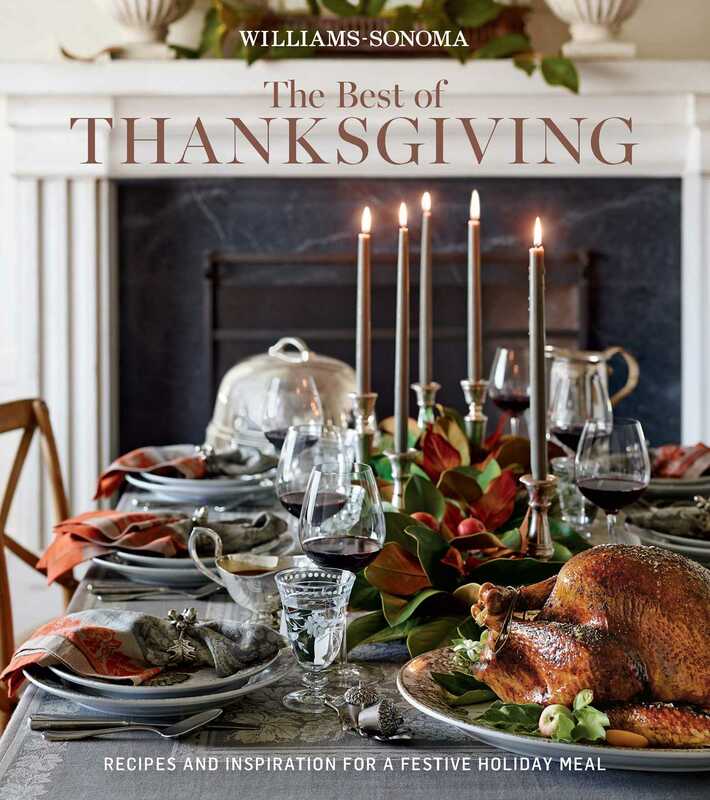 Helpful tips-for staying organized; selecting, preparing and carving the turkey; and putting together a menu, complete with a timeline and beverages-round out the pages of this beautifully photographed book. Preheat the oven to 375°F (190°C). In a sauté pan over medium heat, sauté the bacon until crisp and browned, about 6 minutes. Transfer the bacon to a paper towel–lined plate to drain. Using a fork, prick the skin of the sweet potatoes several times. Arrange on a rimmed baking sheet and bake until tender, about 11⁄4 hours. Let cool. Meanwhile, in a bowl, stir together the brown sugar and flour. Add the 2 tablespoons diced butter and, using a pastry blender or 2 knives, cut the butter into the dry ingredients until the mixture resembles coarse crumbs. Stir in the pecans and bacon to make a streusel mixture. Refrigerate until ready to use. When the sweet potatoes are cool enough to handle, halve them lengthwise and scoop out the flesh, reserving the sweet potato skins and keeping them as intact as possible. Arrange the sweet potato skins on an aluminum foil–lined rimmed baking sheet. In a food processor, combine the sweet potato flesh, the ½ cup melted butter, the cream, cinnamon, nutmeg, and salt and process until smooth. Spoon the sweet potato mixture back into the skins on the baking sheet. Sprinkle the streusel mixture on top, dividing evenly. Bake until the streusel is toasted, 10–15 minutes. Remove the sweet potatoes from the oven and heat the broiler. Sprinkle the marshmallows evenly over the streusel. Broil the sweet potatoes until the marshmallows are lightly browned, about 2 minutes. Serve right away.